Writing an obituary is an act of love that can accomplish many things. At its core, an obituary is a declaration of loss, an acknowledgement of grief, and an expression of joy all-in-one. It celebrates the life of a loved one in a way that few other ways can. Beyond what an obituary can accomplish emotionally, an obituary also has logistic importance, as it acts as an official notice of death that lets the community know of a loss. Historically, this communication of a death would happen via newspaper, where a family member would pay a newspaper several hundred dollars to publish an obituary and obituaries would be listed on an obituary section of the paper. However, on Ever Loved, you can write and publish an obituary online when you create a free online memorial website for a loved one. In addition to acting as a death announcement, an obituary can also be used to communicate service, burial, and memorial information and prescribe ways to donate to a cause, send flowers, volunteer, and help the bereaved. An obituary is also a final tribute to a life well-lived, as it briefly recounts a loved one’s life as a short biography. It can be used to portray the arch of a loved ones life – from birth, through life, and arriving at death – and provide a symbolic closure to a person’s story. Here’s a step-by-step guide on how to write an obituary. We've also written a few obituary templates for you in case you need to write your own. We hope this obituary writing help can provide you with the tools you need to honor a loved one while also following traditional practices. Writing a death announcement in the first paragraph serves the purpose of letting the community know the details surrounding the loss of a loved one. Typically included in a death announcement are a loved one’s name, age, and place of residence, along with the time and place of death. Another example would be the difference between “long struggle with” or “hard fought battle with.” Depending on the appropriate tone and context, there may be an argument for choosing one way of wording a phrase over another. Tip: Before you begin writing an obituary, make sure to interview friends and family to gather notes about their life. While not every memory will be able to make it into the brief biography, your time interviewing family members can help you place a loved one’s life events in chronological order and discover passions and hobbies you may not have known about a loved one–not to mention also being a therapeutic exercise when grieving the loss of a loved one. As you write a biography, be sure to consider how you might bring a loved one’s story to life with a few anecdotes, memories, and even inside jokes that readers might appreciate. Remember: this is an opportunity to commemorate a loved one in a way that they would want to be remembered. If they loved music, why not list a few of their favorite songs! Of course it’s all up to you. 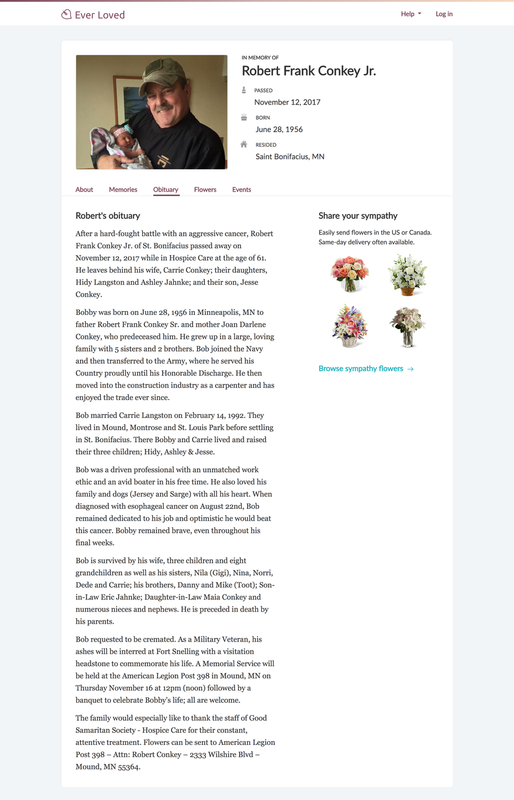 Naming a loved one’s family members when writing an obituary has a lot of value. For one, it gives community members a way to know who is a part of the family and therefore who might be grieving and need attention. Additionally, naming family members can serve the purpose of honoring those who have previously passed while making a tribute to the bereaved. When listing family members who are still living, it is common to use phrases such as “survived by”. Remember: when listing family members, it's best practice to include close family such as parents, siblings, a spouse, children, and grandchildren. It’s common to name parents, siblings, a spouse, and children while it is less common to name all grandchildren, nieces, and nephews. Bob is survived by his wife, three children and eight grandchildren as well as his sisters, Nila (Gigi), Nina, Norri, Dede and Carrie; his brothers, Danny and Mike (Toot); Son-in-Law Eric Jahnke; Daughter-in-Law Maia Conkey and numerous nieces and nephews. He is preceded in death by his parents. A Memorial Service will be held at the American Legion Post 398 in Mound, MN on Thursday November 16 at 12pm (noon) followed by a banquet to celebrate Bobby's life; all are welcome. Tip: On Ever Loved, it’s easy to list out funeral events with rich information such as maps in an elegant design. 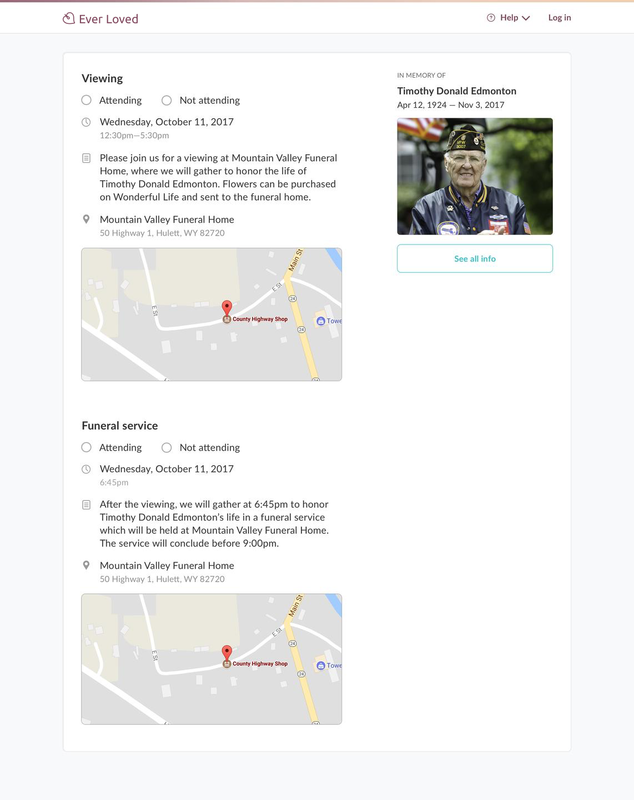 In addition, you can collect RSVPs to funeral events to make it easier to plan for the number of people who will attend the funeral events. “Flowers can be sent to” is a phrase commonly used to help instruct community members on ways in which they can send flowers. You can specify that “flowers can be purchased on Ever Loved here” if it makes it easier. Of course if you prefer to deter community members from donating flowers, you can use the phrase “in lieu of flowers” to instruct community members on other ways they can contribute. Photos can typically be added to obituaries published on newspapers for an additional fee. If you’re planning on publishing your obituary on Ever Loved, it’s free to create a page where you can share memories and collect pictures, memories, and condolences as part of creating an online memorial. It’s important to get obituary writing help since an obituary can help express what’s at times hard to say, especially while grieving. An obituary can help acknowledge and announce the death so that a community may come together, commemorate a life well lived, and be provided with ways that they can participate in celebrating the life of a loved one. The best obituaries aren’t ones that are the most expensive to publish in a newspaper, rather obituaries that are well-written and are written from the heart are ones that stand out and stay with people forever.